I have a scale modelling project in the planning stages. I want to make an Aussie Vietnam-era tank transport combination in 1:25 scale. I have the Tamiya Cent that I will build and modify to Aus spec, and I may have a source for drawings for the trailer and dolly. What I have been unable to find are a good set (or even a single one!) 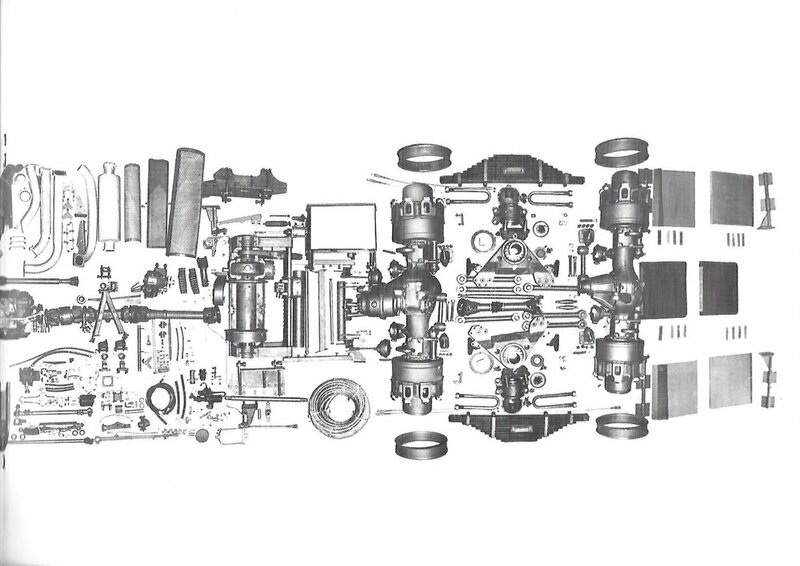 of dimensioned technical drawings of a Leyland / Scammell Contractor. I have heaps of photos of one in a museum here, but no drawings. Is anyone able to point me in the right direction where I might source such drawings? I have been combing the web looking for years. 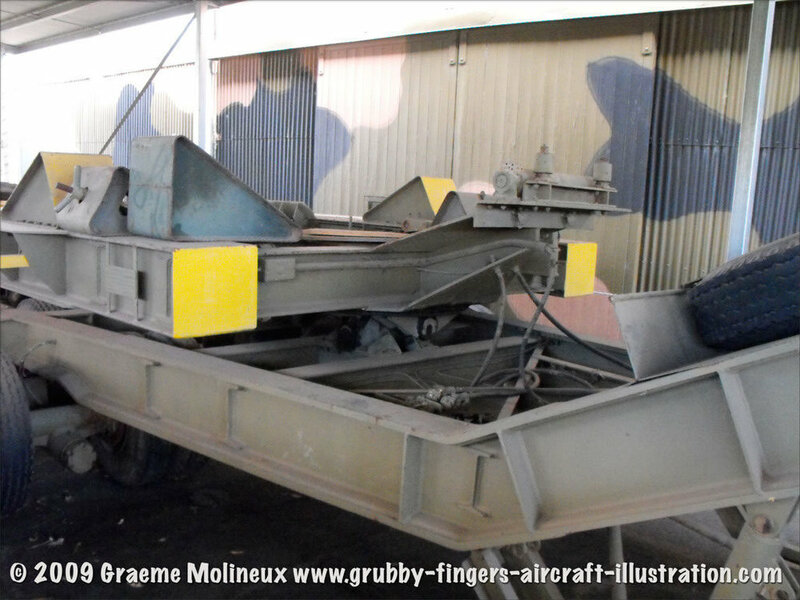 You can find my pics, and many other MV walkaround galleries, on my website: grubby-fingers-aircraft-illustration.com. Why the crazy twin trailer, the load bed is far too high and very little of the weight is placed over the tractor 5th wheel? I always wondered that myself, Mike. That is such a long way up off the ground. Why not a well-deck or low-loader configuration? From memory, the main trailer pivot is pretty much over the dolly bogie, so very little load on the fifth wheel at all. Except for the weight of the enormous dolly itself, of course! Actually, it is a fair wayforward of the bogie centre, so there would be significant weight on the tractor fifthwheel. Why the crazy twin trailer, the load bed is far too high and very little of the weight is placed over the 5th wheel? It isn't a twin trailer but a Jeep Dolly that attaches to the fifth wheel of the tractor unit and has another fifth wheel on the dolly that the trailer attaches to. 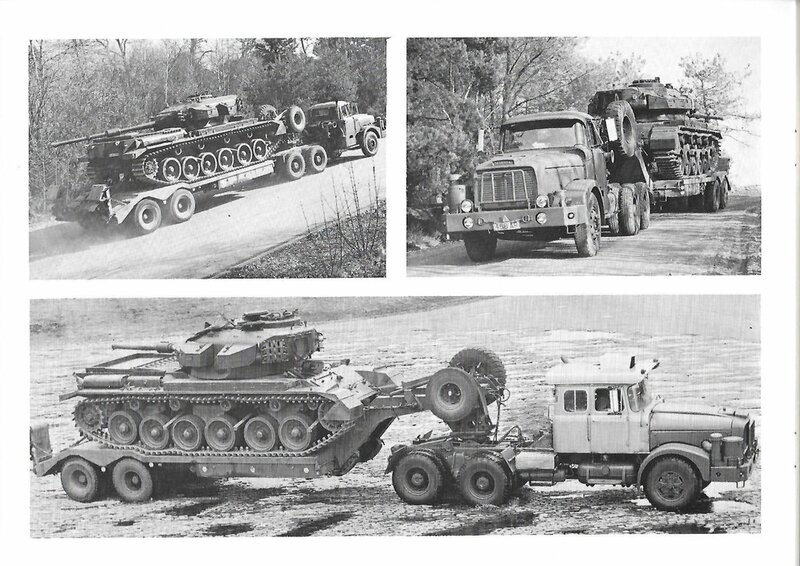 Jeep Dollies are quite commonly used in heavy haulage. Their main purpose is to spread the weight over more axles therefore reducing the load on each wheel. 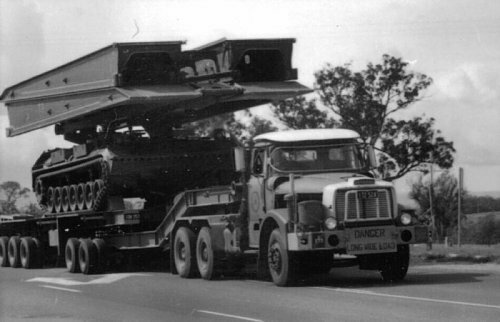 As far as I can see this is a really dumb design of tank transporter developed to meet equally foolish civilian heavy haulage regulations.. No doubt the prevailing regulations provide for low axle weights and a wide spread. It would be fine for wide open roads of Australia or North America but absolutely hopeless in many parts of the world. What happens if in a tactical situation you need to reverse and turn around? The typical single and twin axle Jeep Dollies as used by heavy hauliers are used to supplement the tractor rear axles, not to be the main load carriers. As John has written, it could be that regulations in Australia require such a set up, perhaps Graeme knows the answer. Out of interest here are a couple of developement vehicles under test and an illustrated list of Contractor parts for Graeme to be getting on with. The rear bogie in all cases is the 30 ton version as opposed to the heavier 40 ton. The photo in the following link will show you more of Aussie heavy haulage trailer configuration. Yes, similar concept but note how much closer to the tractor the second fifth wheel is mounted. Yes the axles of the jeep dolly are closer to the Contractor but it is still a dumb set up. Firstly because it looks as if the trailer is mounted onto the jeep dolly by means of a double oscillating fifth wheel but the jeep dolly is also mounted the same way. That is why the unit is still on its feet but the trailer is over. 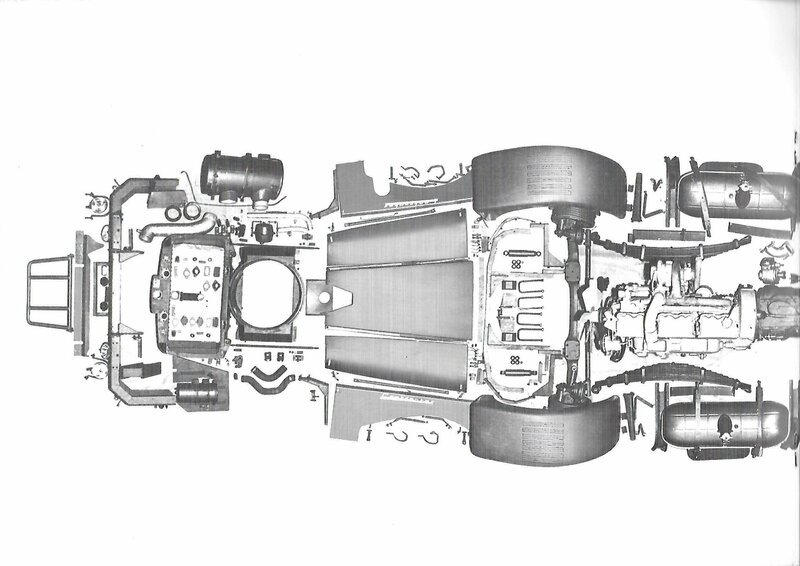 Secondly because of the axle spacing arrangement is so daft. It is a good thing that our UK Department for Transport is far more sensible and our heavy haulage regulations work well. I'm not sure that is fully to scale, the six vehicles depicted are all to different unspecified scales and other than assuming the tyres are 12.00x24, the bogie being a 30 ton and the chassis rails are 12" deep it would be difficult to scale the rest. It could be done but there are other unknowns such as the width of the chassis and cross member positions. MUGAF posted an image of the front cover of the brochure I took the scan from. Have you tried the Scammell Register?